Setup took a while, but was quite straightforward. Once all the tape and packing material is removed, and the unit is plugged in, it goes into a self test and calibration mode. This takes a long time, maybe not quite the full 20 minutes advertised in the setup guide, but a while. The touch screen and wizard for setup made connecting it to my network wirelessly a breeze. Once that was done I could scan from my chromebook, just by pulling up a browser and pointing it to the printer's built in web server. A nice feature was that after the network setup the printer printed a page with all the network details, including the IP address. From the browser I could click scan, and away it went. Next I setup "web services" which, among other things, lets you print by send an email to the printer. This was a little more involved, but still straightforward. The printer printed another page with a code, and directed me to go to eprintcenter.com and sign up with that code. I was able to do all this from my chromebook. It auto assigns an email address, but you have the option to pick your own. Having done this I clicked Print in the Chromebook and it led me through a very simple setup of Google Cloud Print, which basically just involved adding the email address of the printer. Worked first time. I did also install the CD on one of our laptops. All the usual bloat that you get when you install printer software. But the usual program we use for scanning worked too. Printing from an iPad was very simple. Open a browser or email, click the export arrow icon, click Print. It prompted me to pick a printer, clicked on the HP, and then I could click Print. Worked first time. I also installed the HP iPrint app, which makes scanning from the iPad very easy too. At some point during my experimentation the printer asked me to download an update. This went very smoothly, and the download was quite quick. When the printer rebooted itself it did go back through a calibration and printer head cleaning cycle. This one probably took less than 5 minutes, so quicker than the initial one. However, I'm hoping it doesn't do that every time it reboots, since I could see that getting annoying if you were trying to print something in a hurry. All around very happy. It does everything it was advertised to do, and was easy to setup. This is looking impressive. This will file under my consideration for an all around home office printer. 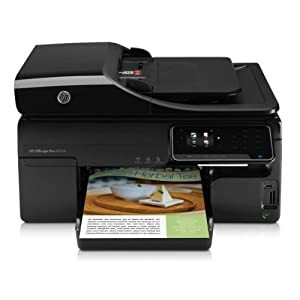 I was able to use HP printer before, and I can say that it's one good product. What I like about this printer is that it allows you to print a document using eco print mode to save ink. HP is also known for its green printing capabilities. I'm wondering if I need a firmware update? On the Information page it says I have version "DLM1FN0842BR" - what version are you using? My firmware version shows as LRP1FN1231AR and my product model number is CM755A. For me "Web Services" shows up in the embedded web server interface as one of the "tabs" across the top (Home, Scan, Fax, Web Services, ...).